My connection with the NDA began by chance, with a university project on the underground waste repository that will eventually be constructed to hold higher-activity radioactive waste from all over England and Wales. I was studying at Leeds and having monthly discussions with the visiting NDA representative about the project. It really sparked my interest in nuclear, leading to an application to the nucleargraduates scheme. My first secondment was with the Technology Team at the NDA, which was my sponsoring organization. This was a really useful introduction to the NDA’s strategy and technical work. It enabled me to work with stakeholders from government, the Site Licence Companies (SLCs) and suppliers, as well as looking at improving opportunities for smaller businesses. Small R&D companies are often bursting with creative concepts but may lack support or investment to develop their products and reach out to the market. My role involved further developing the NDA’s existing partnership with the government’s Innovate UK to encourage innovation in the UK supply chain to support nuclear decommissioning in particular. 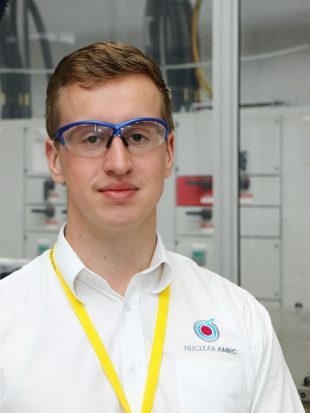 Civil engineer Jack Hardy spent 8 months with the NDA as part of the nucleargraduates training scheme and now works for Nuclear Advanced Manufacturing Research Centre (NAMRC). My next secondment took me to the Nuclear Advanced Manufacturing Research Centre (AMRC), near Sheffield. This is a collaboration of academic and industrial partners from across the civil nuclear manufacturing supply chain. Its mission is to help UK companies win work at home and overseas so this work strengthened my interest in innovation. Although its focus is not just decommissioning, it brought me into further contact with Innovate UK, with the NDA and with Sellafield Ltd, where I was able to support the early stages of a manufacturing improvements programme. From these experiences, I knew there was a wealth of other opportunities for the Nuclear AMRC to support the NDA mission while delivering its own mission and I’ve been keen to pursue this ever since. After completing the nucleargraduates scheme with a final secondment studying the structural integrity of a shutdown nuclear power plant in Spain, and returning to the Nuclear AMRC as Project and Business Development Manager, I feel like my ties with the NDA and its mission are stronger than ever. The Nuclear AMRC is now delivering against a decommissioning sector strategy and has worked with the wider NDA estate, including collaborations with LLWR, INS, RWM, Dounreay, Magnox, Britain’s Energy Coast and key UK suppliers. In addition, we are now scoping our largest collaborative R&D programme to date with this sector, which aims to reduce Sellafield’s lifetime cost of Intermediate Level Waste packages through enabling supply chain innovation to challenge current specifications and assumptions. I still meet with my NDA mentor. I am working towards engineering chartership and have also received an offer to study a part-time PhD at the University of Sheffield. The nucleargraduates scheme works really well at enabling participants to develop links, contacts and understanding across the whole nuclear sector. It helped me personally to enhance the links between Nuclear AMRC and the NDA estate, and is delivering real benefits for the UK nuclear industry. It’s exciting to be a part of it. The highly acclaimed nucleargraduates scheme was launched by the NDA in 2008 and provides a comprehensive training programme over 2 years. Backed by a wide range of leading public and private sector organisations, the scheme aims to build the next generation of industry leaders. Secondments with UK and overseas organisations help to develop a broad understanding in key areas such as decommissioning, power generation and defence. 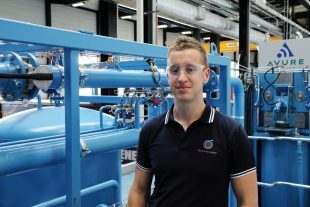 Graduates from both technical and non-technical disciplines are eligible to apply to the scheme, which is now administered by Energus in Cumbria.